Give your dog a great workout with the Kong Extreme Flyer toy. Your pet should get plenty of exercise to keep them fit and strong. This frisbee-style toy is a simple way to get them moving and keep them stimulated. Not only will an intense game of fetch give your dog a good cardiovascular workout, it also helps them to build strong muscles. Around 30 minutes of play a day is enough time to keep your pet at their physical peak. Games of fetch are great for teaching obedience and keeping them mentally engaged. You can also mix things up and roll this toy along the floor for your dog to chase. Made from durable rubber, this toy is a great surface for your dog to chew on – drawing them away from your furniture. Chewing massages the gums, improving blood flow, helps to remove tartar and plaque buildups and reduces stress. 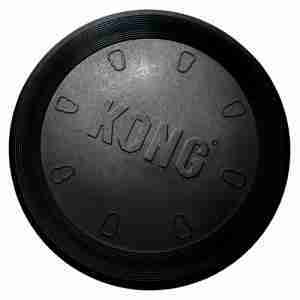 The Kong Extreme Flyer is a great way to get your dog on their feet. It flies easily through the air for your pet to chase. The durable rubber is made to withstand even the toughest of chewers, so this toy is likely to be one of their favourites for a long time. It’s non-toxic too, so you don’t have to worry about them gnawing at it. To keep it clean, simply wipe it down with a damp cloth. Encourage your dog to chase and fetch this toy when you're out for walkies. If they're reluctant, take plenty of treats along with you as a reward. purchased these many times and will buy again.My dog loves to play frisbee !!! Have always bought the excellent Kong Flyer which is brilliant! The best toy my dog(a staffie) has ever had. Bought the super Flyer recently expecting it somehow to be even better and it is not nearly as good as the original. I can't get it to fly properly. I think its because it is more floppy than the original. My GSD absolutely loves this toy a Kong Extreme Flyer, it's a pity she hasn't managed yet to throw it back to me. What I love about it is the way you can screw it up to put inside a coat pocket then it's no bigger to carry then a Tennis ball. Great product and good fun for Dog and owner! First purchase of this Kong Extreme Flyer. Previously bought red ones which my staffie would demolish in about 3 weeks. Guess how long this one lasted....15 minutes. What a total waste of money. So if you have a dog that 'rags' toys, don't buy this, You will just be throwing money in the bin.